The current banner o Sirie (Arabic: علم سوريا‎) wis re-adoptit in 1980. It is an aa the banner o the umwhile Unitit Arab Republic. The first banner tae be uised bi the Sirians, in 1920, wis the current banner o Jordan wi the green an white colors reversed. The colors an design wur taken frae the Pan-Arab banner an inspired bi the banner o the Arab Revolt. The starns staund for the fact that Sirie wis the first kintra tae uise the Pan-Arab colors. The French chyngit the banner o Sirie unner thair mandate intae a blue banner wi a white crescent in the centre an a French banner in the canton. Efter a month the banner wis chyngit intae a horizontally striped green-white-green banner wi a French tricolor in the canton. This banner wis in uise frae 1925 till 1936 (alang wi banners o several cantons intae which Sirie wis dividit unner French colonial rule). Then the banner wis chyngit intae a horizontally striped green-white-black tricolour banner wi three reid five-pointit stars in the centre o the white stripe. This follaed the signin o the Franco-Sirian treaty which gae Sirie pairtial unthirldom. The first naitional banner o Sirie efter unthirldom in 1946 wis this green-white-black banner wi three reid stars. In 1958, Sirie an Egyp merged tae form the Unitit Arab Republic an adoptit the reid-white-black design wi twa green starns that is Sirie's current banner. When Sirie left the UAR in 1961 it briefly revertit tae its auld green-white-black banner. Housomeivver, the Ba'athist coup in 1963 led tae a reid-white-black banner wi three green starns in the white baund (the same banner uised bi Iraq at the time — rumors o a union atween the twa naitions aboondit). In 1971, a reid-white-black banner wi a gowden hawk in the white stripe wis uised as a banner for the Federation o Arab Republics which consistit o Sirie, Egyp an Libie. The starns wur remuivit frae the banner an replaced bi a gowden hawk (the "Hawk o Qureish"), hauldin a scroll wi the Arabic name o the Federation. In 1980, the current reid-white-black banner wi twa green starns in the white stripe wis re-adoptit. The chynge restored the tap reid stripe tae the same reid uised in the Unitit Arab Republic banner. The banner o 1972 haed lichtened the reid colour slichtly. Sicweys Sirie haes haed sax naitional banners (o fower distinct designs) syne unthirldom in 1946. Each o the states in the French Mandate o Sirie haed thair an banner. The Sanjak o Alexandretta, which wis a pairt o Aleppo frae 1920 tae 1923 an then a pairt o the Alawite State frae 1923 tae 1938, did no hae its awn banner till it became independent as the State o Hatay. The colors o the banner are traditional Pan-Arab colors, an aa seen on the banners o Yemen, Egyp, Sudan, an Iraq. The twa starns represent Egyp an Sirie, the twa participatin naitions in the Unitit Arab Republic. The green is thocht tae be the colour o the Rashidun or Fatimids, white the colour o the Umayyads, black the colour o Abbasids an reid the colour o the bluid o martyrs, awtho it is thocht that reid wis the colour o the Hashemite dynasty an it wis addit efter Sharif Hussayn o Hijaz agreed tae jyne the Arab revolt o 1916. 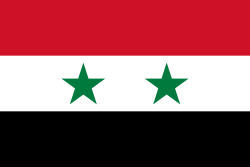 Wikimedia Commons haes media relatit tae Flags of Syria.